I needed to sit on J.J. Abrams’ Star Trek for a few days to make sure this review was going to be fair. Three days later, it still sits respectably in fourth place on my all-time Trek films list. Just for reference, below it counting down are First Contact, Undiscovered Country, and Wrath of Khan. Star Trek is easily the most ambitious film in the franchise, and it succeeds astoundingly well at what it set out to do — rebooting continuity in a way that still manages to be in continuity with the rest of Gene Roddenberry’s universe. And it did so with style, persuasive character-driven performances, and a Staten Island junkyard’s worth of Easter eggs incorporating salvaged tidbits from the universe it left behind. The movie suffered from two major shortcomings that kept it from fully overtaking my top three (and another one that probably just makes me unreasonable). The first of these deals with something Roger Ebert brought up, which is that the film spent so much time dedicated to its narrative overhaul (to its credit, fastidiously covering its bases along the way) and missed out on creating a compelling story beneath it all that really jarred me in a way that resonated alongside the great Trek stories. Maybe the new rendition of the cast just needs to establish itself first, as it did in the film before we can get the epic clashes and turbulent Shakespearean storms that the good films have produced, but if that’s in the cards, it’s going to have to wait for a sequel. On that same note, the villain in the movie, Nero, fails to even make my list of top five Trek film villains and comes closest to being mentioned alongside that horrible fellow Romulan of his from Nemesis. 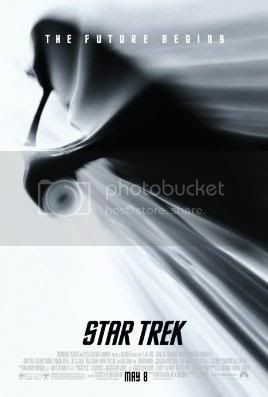 *Spoiler Alert here* Basically, the whole story spins out of his desire for revenge against Spock and the Federation because Spock was trying desperately to save Romulus, his homeworld from a star going supernova. Spock ran out of time, the Romulan Empire perished as a result, and Nero decides to take the singularity-spawning “red matter” that Spock had gathered to stop the supernova and use it to wipe out Spock’s home planet of Vulcan and every other Federation planet he can find. I understand his anger, but this was a supernova, i.e. a galactic scale natural disaster and Spock was the only one doing anything worthwhile to try and save his home planet. The existence of the red matter itself is proof of Spock’s hard-fought effort. I would also like to point out that Nero’s ship lacks the brilliant design of new ships in past Trek movies and is a near imposter of the Nephilim Tiamat and Kraken ships from Wing Commander: Prophecy, which was disheartening. Furthermore, there was also an appearance by a monster that was nearly identical to J.J. Abrams’ Cloverfield alien that also made this new pocket universe he’s created seem less unique than its predecessor. The second major dimension of the film that seemed lacking was the dialogue. The story and narrative mechanics in the face of an enormous meta-narrative task were respectable, but the polished lines and memorable quotes of Wrath of Khan and Undiscovered Country seem to have been rejected in favor of quippy cliche oneliners and honestly some pretty lame unnecessary jokes (like Leonard McCoy’s stilted revelation of where his nickname “Bones” came from). Given the earning power of the lead cast members in the film (particularly Chris Pine, John Cho, and Simon Pegg) I can only assume that a television spin-off is out of the question, meaning the Star Trek franchise is switching gears for the first time in its existence to only appearing on the big screen with a cast who has never been together in a TV series. I appreciate the spectacle and continuity-aware narrative acrobatics that we’ll be treated to with future installments, but this shift is also reason to mourn the loss of great sci-fi and speculative fiction narratives that have enriched the franchise up until this point. I’ll be sad to see that take a back seat to sugary content and explosions if that’s what happens. None of this is to take away from a lot of great character acting and development on the part of the new cast. Simon Pegg and Zachary Quinto in particular pulled off feeling homages to the actors who preceded them. And Karl Urban was just downright creepy in his believability as a young DeForest Kelley. Additionally, there was a stupendous overabundance of balance and inspired narrative architecture at work in the story’s broad strokes. The notion that Romulus was wiped out in one universe and Vulcan in another, as well as the effective integration of Kirk’s loss of his father reflected across the bridge by Spocks maternal loss keeps you watching both sides of the screen, story, and conflict at all times, and demonstrates the feeling attention that went into the film. The use of Leonard Nimoy was also effective, and in many ways this was a much better executed passing of the torch than Generation, where the plot device felt entirely too contrived and arbitrary. You really did feel in Star Trek as if the old guard was helping push the new flagship off the docks with a tear forming in one eye, sharing in the sentiment, but anxious to see what will come from the seeds they’ve sown over the decades. And Abrams and company to produce a parade of astonishing sequels that live up to Wrath of Khan and Undiscovered Country, there is probably a lot of room for Star Trek to grow with me. I’m open to that. As for that last problem, which I know if going to make me sound like I have unreasonable expectations (I do), I have to say that it bothered me that all of the technology in the film appeared to be decades ahead of time period when the film took place. I was half expecting for the entire film to see some revelation that a shuttle or ship parts had been salvaged from the first scene’s encounter and had some incredible impact on the course of invention and design. It could have been dealt with in a throwaway line and been completely taken care of as an explanation in 15 seconds, which is the other reason it bugs me. At the end of the day I did enjoy the movie, though. Its faults for the most part weren’t a product of its storytelling so much as they were of lack of time to tell a story while it was tinkering with characters to make the franchise’s transition in the alotted time. And Abrams has an uphill battle to fight with me for the sequel to convince me the whole franchise isn’t getting sugar-coated and dumbed down for the foreseeable future. That said, I do have faith in the guy’s ability to bring his new Star Trek pocket universe to that next level. Just please leave Cloverfield out this new pocket universe. This movie got a slow pitch from me as far as initial expectations were concerned. I wanted Die Hard with adamantium claws, big explosions, and some rough Wolverine vs. Sabretooth fights. Maybe some continuity-referential Easter eggs for bonus points. For the most part it delivered that much (minus the eggs) — it just suffered from a series of isolated tumors of awkward executions and special effects that came off looking unfinished and slightly askew. The basic story structure and majority of the script were on the mark. It stuck to the existing mythos of Wolverine’s origins pretty well, and took its chances in the final minutes with surprisingly original twist with the Deadpool character, Wade Wilson, played by Ryan Reynolds. I’m going to give the film its highest marks on the story itself, though it lacked the broader timely relevance of an Iron Man or V for Vendetta, so at least in the scheme of comic book films I’ve seen it’s better than X3 and Elektra, even better than Daredevil, but it’s firmly middle of the road, just below the overall quality of Hellboy (and I give Hellboy the nudge above Wolverine because of the visual innovation). Wolverine is handily middle-of-the-road, which isn’t a tremendous knock. It just doesn’t go the extra mile. The movie also suffers from a few off-kilter moments where one of two things happened: 1) The special effects being used weren’t nearly as polished as they should have been or 2) They were polished. They just chose inferior technologies that weren’t up to today’s standards. The first example of this was Wolverine’s claws, something that should have been on the list of the three top things that should not have been screwed up in this movie; yet on several occassions, when Logan was standing still moving little more than his fist, the claws seemed to jerk out of sync with his subtle motions to the point that they looked as if they’d been pulled from an ACME crate in Who Framed Roger Rabbit?. I’m also going to call out the surprise appearance of Patrick Stewart toward the end. I can’t tell if there was age-defying CGI going on there or if they just caked on the make up and wrinkle cream too much, but I really felt as if I was looking at another actor with Patrick Stewart’s eyes, nose, mouth, and voice stapled on. All of this was distracting if nothing else. That said, when Scott Summers blows apart his high school, there should not be flaming cinders left across everything he hits with his optic blast. I’m willing to accept that the grafted optic blast onto Weapon XI, the super-mutant that Wade Wilson becomes, just isn’t as powerful as Cyclops’ because it barely makes it past cutting through the nuclear power plant smoke stack. The nature of the superhero movie requires a suspension of disbelief, but the effects gurus really should have covered their bases for continuity’s sake just a little better.